SAOTA is a firm of architectural designers and technicians which is driven by a dynamic and potent vision easily distinguished in their design. This, paired with both an innovative and dedicated approach to the execution of projects, has seen SAOTA become an internationally sought-after brand. 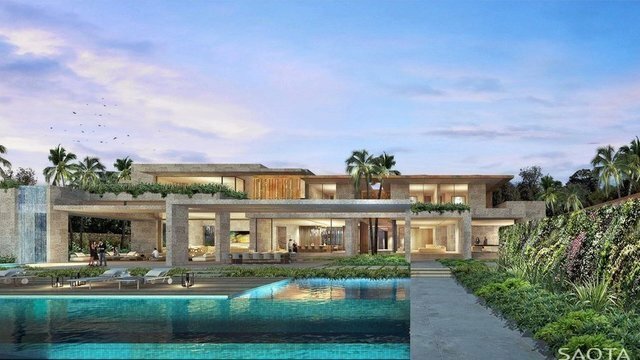 With their first home design in the Dominican Republic and conceptualized on one of the most extraordinary Beachfront home sites within the Casa de Campo Resort in La Romana, Villa "La Paz" has been created conceptually and awaits a Connoisseur of Life to execute the project. Featuring 11 bedrooms distributed between a main house with 6 bedrooms and a guest house with 5 bedrooms, each with en-suite bathrooms + over 6 half-baths throughout both houses, there is plenty of space and privacy for the entire family. Encompassing the design is also a club house and soccer field for the family. Capitalising on a unique understanding of an ever-evolving industry, SAOTA has strong roots in South Africa and worldwide, , with 85% of their clientele having commissioned their residences in cities like Moscow, Sydney, Miami, Los Angeles and Dubai. What has truly been the momentum behind this success is the meeting of function and form, the balance of the needs of their clients and the pursuit of true architectural design. Ensuring that clients see significant returns on their projects has led to not only a growing client base, but repeat commissions. The focus on achieving maximum value has also led to global invitations to design, build and create highly prestigious projects.